More than 2,009 homicides have occurred in 2018 compared to 1,647 recorded in 2017. 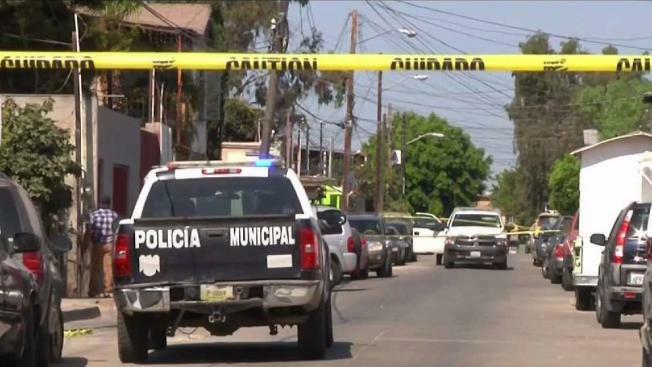 More than 2,000 homicides have occurred in the city of Tijuana, Mexico so far in 2018, according to figures from the State Attorney's Office (PGJE) obtained by Telemundo 20. No matter how many people are killed, residents say they won’t get used to the feeling of insecurity. "Terrible, there are murders everywhere, there are women who drag them to steal their bags, there are signs hanging from bodies," Silvia Rosas, a merchant from the border city, told Telemundo 20. About seven people are killed in the city daily, amounting to 2,009 deaths this year compared to 1,647 total homicides in 2017, according to the PGJE. In the face of violence, citizens say they walk carefully through the streets. However, some murders even take place a few meters away from the Municipal Public Security Secretariat. The PGJE numbers show 2018 has been the deadliest period in the city’s history. Just six years ago in 2013, there were 508 homicides. Despite the record frequency, Tijuana Mayor Juan Manuel Gastélum says he expects the numbers to improve. "The sun comes out every day, every day there is an opportunity to be better, every day there is an opportunity to improve, I would bet on that, to improve," said Gastélum. According to Marco Antonio Sotomayor, Secretary of Public Security of Tijuana, the opportunity to fight against violence is lost due to the changes that exist in the penal system. The Ministry of Public Security also added on Monday that although 90 percent of homicides are linked to drug dealing, there is no support from the federal government.